One of the less known components in the universe of college related choices is the military. 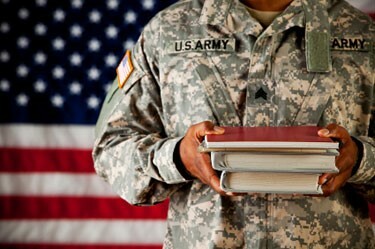 Military educational benefits are broad, varied, cost saving and include programs for studying while in college, after military service or even during military service. Typically the military choices come in two forms, ROTC and the academies. The academies have a long and distinguished history in the United States and have produced both great leaders and Presidents. ROTC programs have not been around for nearly as long but have also distinguished themselves since their inception. ROTC programs are offered at over 1,000 colleges and universities across the country and are designed to train qualified young men and women to become United States military officers. Upon graduation, ROTC members are commissioned as 2nd Lieutenants in the Air Force, Army or Marine Corps or Ensigns in the Navy. There are four-year and two-year plans, scholarships, financial assistance, and a variation for veterans. How does the four-year program work? The four-year program is divided into two parts; the Basic Course and the Advanced Course. Uniforms, textbooks and materials are furnished at no cost to the student for both parts. The Basic Course, consisting of military science classes, is usually taken during the first two years of college. Students are then eligible to apply for the Advanced Course, normally taken during the final two years of college. It also includes a paid; 4-6 week training session called Advanced Camp, usually attended during the summer between the third and fourth years of college. Before students are accepted in the Advanced Course, they are required to sign a contract, assuming approximately four years of military service obligation as an officer. Students receive a subsistence allowance in the Advanced Course. What about the two-year program? The two-year program is designed for junior and community college graduates, students at four-year colleges who did not take ROTC during their first two years of school; students entering a two-year post-graduate course of study, and high school students planning to attend military junior colleges. To enter the program students must first amend a paid six week Basic Camp. After successfully completing Basic Camp, students who meet all the necessary enrollment requirements may enroll in the Advanced Course. Two, three and four-year scholarships are awarded on a competitive basis to the most outstanding students who apply. A 1200 combined SAT score with 600+ on the math portion will enhance your scholarship chances. The scholarships pay for college tuition and fees and provide a specified amount for textbooks, supplies and equipment, as well as a subsistence allowance. They often give special consideration to students pursuing degrees in nursing, engineering, the physical sciences and other technical skills currently in high demand. For further information contact your local recruiter for information on the branch of the military of your choice on the ROTC program. These include the United States Naval Academy in Annapolis, Maryland, the United States Military Academy in West Point, New York, and the United States Air Force Academy in Colorado Springs, Colorado. Competition for admission to the Military Academies is amongst the most intense in the country. In addition to superior test scores you will need demonstrated leadership qualities, excellent health, athletic skills and involvement in extracurricular activities to be in the running for an appointment. You will also typically need a recommendation from one your state’s Representatives or Senators. Students attending one of the Academies will live on campus, and have tuition, room and board provided. They will also receive a monthly stipend. In addition to a rigorous academic schedule which generally encourages a major in Math, Science or Technology, students study Military Science, drill and participate in physical training. Upon graduation, USMA and USAFA cadets are commissioned as 2nd Lieutenants in the Army and Air Force respectively. USNA graduates are commissioned as either Ensigns in the Navy or 2nd Lieutenants in the Marine Corps. Graduates incur a commitment to serve in their respective services for a period usually no less than five or six years. People join the military for a wide variety of reasons from service to their country, to family tradition to funding their education. Like any decision that is made concerning college and your future, choosing to attend a military program is one that should be discussed with your family and your guidance counselor. You should consider not only your short term goals and opportunities, but also your long term goals, objectives and obligations.